Who are we and why should you entrust us with your business? That's the ultimate question and a good one to ask. I guess most importantly - because we care. We sincerely care about you, about our Company family, about America, and this beautiful planet. In a world full of mediocrity and "me first" attitudes - that in itself says a lot about us. You are our most valued asset, we are humbled by your trust, and honored to be of service. For nearly 50 years our family Company has lived by the standard of doing what's right. Not what is popular, not what's trendy, not what's politically correct - but what's right. While the statement doing what's right may be subjective - I think we can all agree that inside of each one of us is a moral compass that clearly lets us know what is right. That's the creed we live and work by. That's why nearly half of our employees have been here for greater than 20 years and we're proud of that fact. We're committed to you and passionate about what we do. Every family member is constantly striving for excellence. We believe that shows in our products, service, and dedication to every customer pleasing detail. We care about your satisfaction. Before, during, and after your purchase. This is not a commitment taken lightly. Our sales and customer support staff take great pride in proving this fact every single day. We're not happy - until you are. We care about our environment. We better - our family, children, and pets lives depend upon it. Green is great, and it's a good start. 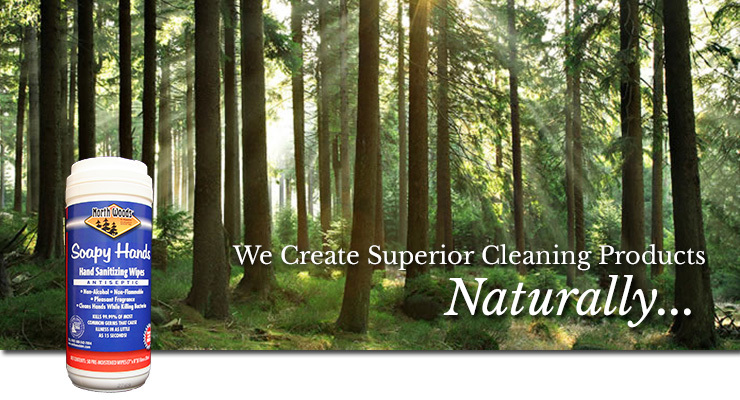 Since the inception of our North Woods® product line in 1982 - we have been striving to bring health, sanitation, and maintenance products to a new standard never before seen. This was long before green became trendy, but it was the right thing to do. Quite frankly though, it's only the start. Our North Woods® UltraGreen™ initiative will once again raise the standards above and beyond what is currently being deemed green. We have a slogan we use to describe our mission, and our aspirations as a Company as a whole. It's The Dawn Of New Ideas. It's what drives us. It's what motivates us to better ourselves in every phase of our operation. We believe the best of times for your family, our Company, for the United States of America, and this planet lie before us. Thank you so much for your support of the North Woods® way of life, and may God bless you and your family. Click here to view information about available employment opportunities.